Hello Handsomites! 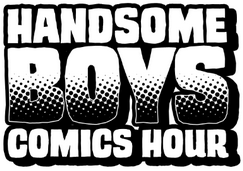 Eric and Robbie bring a rollicking episode of comic goodness to you this week! They review all Indie books this in week in Weekly Floppies, including the spectacular Shutter #1! They serve up a dose of nerdy goodness as always, and talk Ed Brubaker, Winter Soldier, and good ole’ Cap himself in Nerd Boy Book Club! Last, but certainly not least, Randy Savage, the Macho Man himself, makes a visit and talks X-Men! You don’t want to miss it! This entry was posted in Episodes and tagged avatar the last airbender, calculating god, captain america, ed brubaker, flash gordon, linux action show, lumberjanes, macho man randy savage, magnus robot fighter, regular show skips, robert j sawyer, shutter, steve epting, winter soldier, wrestlemania, wwe network on April 15, 2014 by handsomeboyscomicshour.